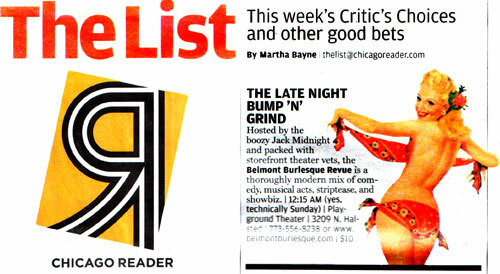 This last weekend, the Belmont Burlesque Revue made the front page of section 2 of the Reader. They've had pretty good audiences, but this weekend's show was sold out and they had to turn a couple dozen people away (the Playground is all careful about fire codes and such, so we couldn't have people sitting in the aisles or anything). 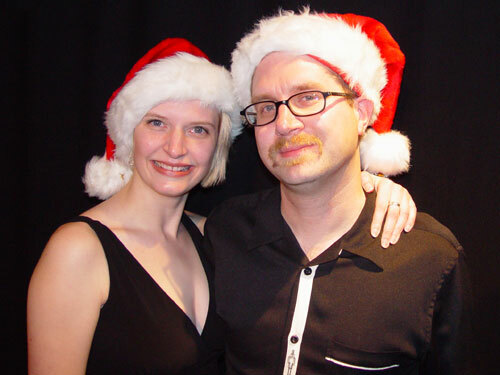 Here's Gerdes and Reid from the Holiday Spectacular. How can two such nice looking people tell such dirty jokes? Practice, my friends, practice. Your next chance to see the Belmont Burlesque is at the end of January. Don't risk another sellout! Camp out now!